Makes approx. 15-20 pancakes depending on how big/small you want them! Sorry there are no pictures next to the steps, I'll take some next time I make them. Mix 200g flour, 40g of sugar, 100g of chocolate chips and a tsp of bicarbonate of soda (baking soda) in a bowl. Melt 40g of butter in a saucepan and add it to the bowl. 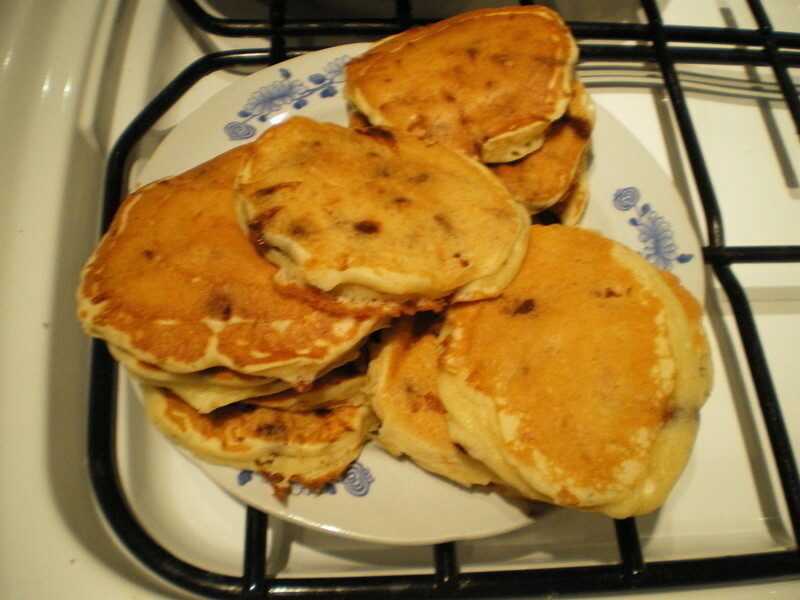 Then, add 200g of milk, 1 egg & 100g of cottage cheese to the bowl and mix it all together to make your pancake batter. The mixture should be quite thick so that it doesn't spread out too much in the frying pan. Put your frying pan on the cooker at a fairly low heat and after a couple of minutes pour in enough batter for one pancake. Cook for a few minutes each side until they are golden brown and slightly puffed up. The trick is for the pan to be hot enough that the pancake cooks properly but not so hot that it burns before its solid enough to flip over. This takes practice so the first few pancakes you make may be burnt/fall apart but don't worry! Oh, my kids will LOVE these! Thanks for sharing your recipe. *is in love* i love love love pancakes and can't wait to try this.